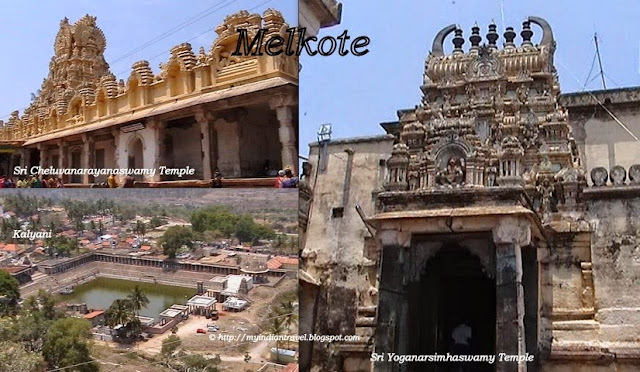 In Melkote there are two important temples. 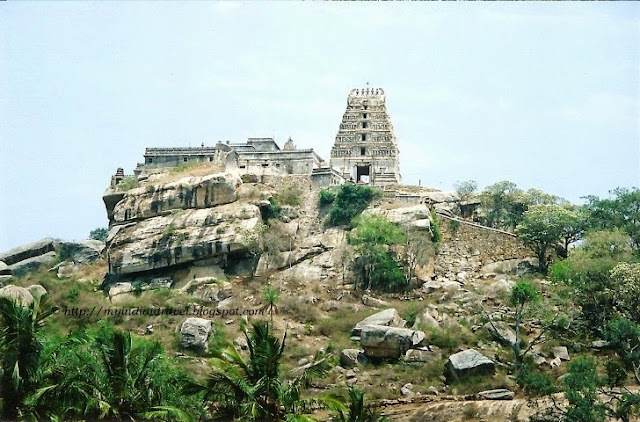 The Yoganarsimhaswamy Temple is on a small hillock. 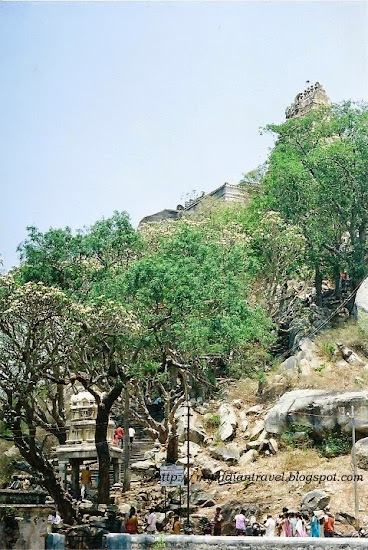 People can climb the steps from the ground level which is approximately 500 steps to the top. If not they can go by their light motor vehicles till the half way almost nearer to the temple. Still from here there are approximately 250 steps to the top. The temple is at the height of 1777m from the mean sea level and is a creation of Hoysala times with a beautiful image of seated Yoganarasimha with Yogapatta. A panoramic view of the surrounding vast area can be had from here. Thia is one of the 7 holy centers of Narsimha worship. A huge drum donated by Tipu Sultan and a bell donated by the Mysore Parakalamatha can be seen here. The timings at the temple are, 9.00am to 1.00pm and 5.30 pm to 8.00 pm. During Saturdays, Sundays and public holidays, the timings will be from 11.00 am to 2.00 pm and 5.00 pm to 8.00 pm. Wonderful place, I've been there twice and love it. Hello, the temple on the hill is a great view! Wonderful images, enjoy your day! How very beautiful!! The temple art work is exquisite! Have a wonderful day! Great place to build a temple.....wonderful all round visibility! A beautiful structure. Interesting that all over the world people built temples and churches high on hills. What an awesome place, Rajesh!! Your captures are terrific as always!! And thanks, as always, for sharing the beauty of your world!! Have a great new week! What a great temple - it matches so well with its hill and rock. That's a perfect location for a temple I think. Nice photos, yes, I love this impressive temple! Sounds like a difficult task walking up 500 steps. i would have fainted. Though we visited Melkote we didn't find time to visit the Yoga Narasimhaswamy temple.Need to plan to visit this temple some time. The walk looks worth the effort. I'd love to visit that beautiful temple. I think I could manage the 250 steps. Amazing shots, but My! all those steps. I would love to see it someday. steps or even 250 are quite a climb! I hope your weather cools down soon--I heard it has been very hot in many parts of India this summer. Nice temple and great captures on the hillock temple. Though it sounds like tough to climb over to top... the view seems to be worth perceived. You have so much culture and historical relics it's breathe taking. Also always educational. My mind is dizzy thinking about how they built that temple way up there. Your blog is one of the few ones that actually writes about pilgrimage sites and temples. It is enlightening to read about such temples in India that are not there on every traveller’s or pilgrim’s wishlist. The temple in Melkote is a definite one on my list, though. Temples are always used to be on hills due to belief that highest point has god's existence. I liked first picture. Thanks for sharing info. Very very beautiful. My aunt keeps raving about this place, and she's egging me to plan a trip. Looking at the pictures, I'm quite tempted now! This is in my wish list. Will visit in this summer. Very nice shots, specially the first one and the one in the bottom left corner.